The bio of Richard Cary Dangar Brimmell | Launceston Then! Richard was born in 1874 to John and Elizabeth Brimmell at 11, Church Street, Launceston. His father was a printer and newspaper proprietor, publishing the ‘Launceston Weekly News.’ He married Eliza Dinnis of North Petherwin in 1898 at Launceston. Shortly before their marriage, in 1897, Richard joined the Press Association as a sub-editor. The first of their three children, Elsie, was born in 1900 at Walthamstow, Essex. She was followed in Richard in 1903 and John in 1905. Richard successively filled the position of night and day sub-editor and during that period he saw great developments in the extension and speeding-up of news service. 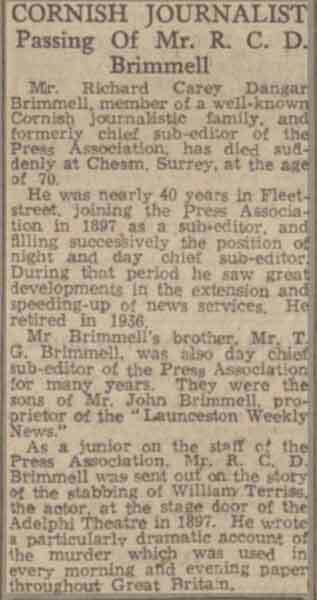 He eventually became the chief sub-editor of the Association. He died suddenly at his home of Chesham, Surrey, on December 17th, 1943. In his will he left a total of £396 13s. 6d.